Iowa: Constitutional Carry Needs Your Help! By now you’ve likely heard all about Senate Majority leader Mike Gronstal and Judiciary Committee Chairman Steve Sodders’ efforts to block SF 137 (Stand-Your-Ground law) from moving forward in the Senate even though it would almost certainly pass and already has 24 co-sponsors. They are feeling tons of heat from gun owners over this, and are nervous about the Fall elections, which is why we are seeing other gun bills move in the legislature. But as they work to blockade Stand-Your-Ground law, they are also doing everything they can to kill Constitutional Carry legislation (SF 400), as well. For those newer members and supporters, Constitutional Carry is a very simple concept: if you’re legally allowed to own a firearm, you’d be legally allowed to carry that firearm for any lawful purpose with no addition permits needed. The current shall issue permit system that we have here in Iowa would remain in effect. If you’d prefer a permit for convenience sake, you’d be free to get one, just like you are now. But if you didn’t want to pay permit fees, go through a bunch of paperwork and bureaucratic hoops, and have your name added to a database – you wouldn’t have to. It’s just the Second Amendment being played out in real life. Several years ago, when Iowa Gun Owners first starting working on this issue, people here in Iowa and across the country said we were crazy. We heard it all from the pundits and anti-gun legislators: “Only odd-ball states like Vermont and Alaska have this system,” “This will never pass into law in a larger population state,” “The courts won’t allow this,” the excuses went on and on. But then Arizona and Wyoming passed it in 2010. Arkansas passed it a few years after that. Just last year, Kansas and Maine passed Constitutional Carry! And so far this year, West Virginia and Idaho have passed it and the Governor in Mississippi is expected to sign it into law there, as well. All told, 20% of the country now enjoys Constitutional Carry status. Gun owners in 20% of the country no longer need permission from the government to exercise their 2nd Amendment rights! As I type this, the Missouri House is about to vote on Constitutional Carry legislation as well, as the bill already made it past two separate committees there. This same legislation passed the Senate in Colorado two months ago. And Constitutional Carry is being considered in over a dozen other states during this 2016 session! The momentum for this simple idea is building all over the country, yet here in Iowa, SF 400 is not being allowed to move forward by Senate leadership. That’s why I hope you’ll sign your petition in support of Constitutional Carry law here in Iowa, so that your legislators know where you stand on this pivotal issue! You see, anti-gun legislators like Gronstal and Sodders like to think that what happens in Des Moines stays in Des Moines, and that they can kill gun bills with no one noticing. If you’ve ever spoken to an anti-gun legislator, you’ll know exactly what I’m talking about. The truth is that the doors are closing in around anti-gunners like Gronstal and his ilk. Gun grabbers are being trounced all over the country. That’s why, just last year when Maine passed Constitutional Carry, it was moved through the House by the Democrats who controlled the body. They didn’t want to deal with the political fallout from opposing gun rights any longer – it’s too dangerous to their incumbents. Iowa is going to enact Constitutional Carry – it’s simply a question of how many more anti-gun legislators gun owners are going to have to remove from office first. 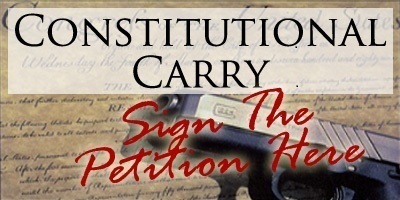 So please stand with us, and sign your petition in support of Constitutional Carry legislation right away! Don’t let them fool you, the gun bills that were advanced so far this session were not advanced because Senator Gronstal and his caucus are pro-gun – as other gun groups are trumpeting. The ONLY reason why they moved at all is, as we’ve said, because these legislators are scared and are in desperate need of a talking point in the upcoming elections. We will be there to counter their lies with the facts about their record on the 2nd Amendment when that time comes, as long as we have the resources we need to fight with. You know what that means, Iowa Gun Owners will be using massive amounts of direct mail, email deployments, social media work, and radio and TV ads – not to mention boots-on-the-ground going door to door, making sure that every gun owner in the races that we are focusing on knows the truth about their legislator’s record on gun rights. But none of that is free. That’s why I hope that once you’ve completed your signed petition you’ll consider a donation to Iowa Gun Owners in the amount of $100. I know it’s a lot, but we are already meeting with candidates, preparing our candidate survey program, and setting up our budget for the elections and I need to know what I have to work with. If $100 is simply too much, please consider $50 or $25, or whatever amount you can afford. The only way that we will continue to advance our gun rights is by exposing anti-gunners at election time, and the only way to do that is by running the program I described above – as big of a program as possible. But whatever you do, please make sure you sign your petition, that’s most important! P.S. State after state has passed Constitutional Carry into law over the last couple of years. In fact, 20% of the states in the country no longer make law abiding citizens obtain government permission before carrying a firearm for self-defense! Iowa needs to join them, but this legislation is being blocked by Iowa’s anti-gun duo, Senate Majority leader Mike Gronstal and Committee Chairman Steve Sodders. Please sign your petition in support of Constitutional Carry right away – make sure your legislator knows that you expect them to advance this critical legislation! Iowa Gun Owners is preparing, even now, to expose as many gun grabbers as possible to the voters in their district using mail, email, social media, boots-on-the-ground, radio, and even TV ads. But we need your help to do it, so please consider a special contribution to Iowa Gun Owners to help us prepare to run this program! Iowa: Big Gun Show This Weekend!